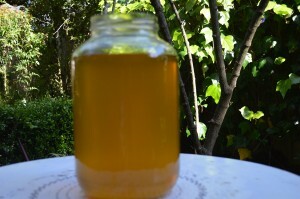 This is a wonderful fermented tea. It contains all of the anti-inflammatory power of ginger and turmeric and it is loaded with beneficial bacteria. Rebuilds the healthy bacteria in your gut. Intestinal bacteria gets destroyed by antibiotic use and chlorine in water. Even you haven’t taken many antibiotics, you might be consuming them unknowingly if you eat meat or poultry that come from factory farms or consume tap water. Eating this sauerkraut recipe regularly will help turn this around. Improves digestion due to the high amount of beneficial bacteria and the ginger. Improves the skin due to the Turmeric. Boosts the immune system according to an article published in “The Journal of Applied Microbiology” in June 2006. This is because a large portion of the immune system is based on healthy levels of gut flora. Turmeric is also stimulating to the immune system. Anti-inflammatory due to the Turmeric and Ginger. Reduces chronic pain due to the Turmeric and Ginger. 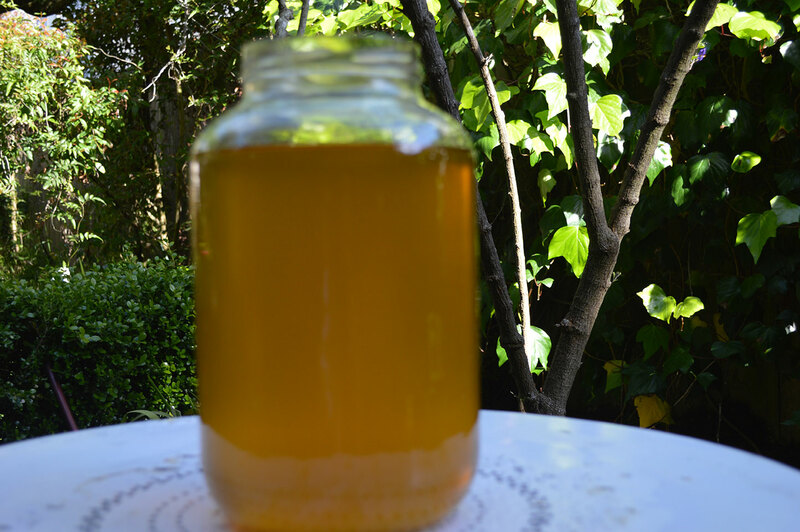 This fermented tea with ginger and turmeric is anti-inflammatory and filled with beneficial bacteria for your digestive system. 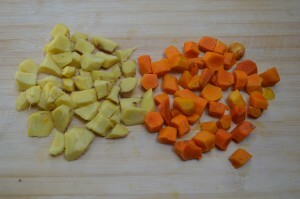 Peel the ginger and turmeric and roughly chop. Pour the water into a pan on the stove and bring to a boil. Add the ginger and turmeric. Turn the heat down to medium low and cover. Move to the refrigerator to cool. 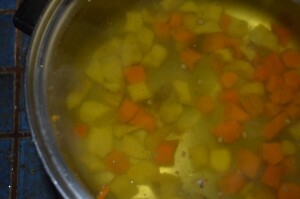 When cool, strain out the ginger and turmeric. Pour into a large one gallon glass jar. Add the sugar or rapadura and mix up until it is dissolved. Cover with a dish towel. Let it sit for 3-5 days. It is done when it tastes tangy, a bit sour and is fizzy. You can add Stevia if you like a sweeter tea. I haven’t ventured down the road of water kefir. I’ve been busy making Kombucha weekly, but I think I need to pick up some grains so I can make this delicious-looking tea. Thank you for the recipe. Wow! Thank you for this recipe. The older I get the more I need anti-inflammatory recipes! Is this the kind of tea that one might describe as “earthy”? I am intrigued but, wondered about your suggestion that one add stevia to improve the taste? Is this more of a medicinal experience? Drink it because it is good for you? It actually tastes really good without Stevia and does not taste medicinal at all. Some people like things that are sweeter and if it ferments longer, it is less sweet. It really just depends on how sweet you like things. We pinned this and shared it to our FB page! Can’t wait to try it!!! I live in Darwin, Australia, which has a tropical climate, so I am a bit anxious about leaving food at room temperature for a few days. Is there a maximum temperature for room temperature? 70 – 80 degrees Farenheit is the ideal temperature, and it really isn’t good to go beyond that. If your place gets hotter than that, if you have a basement or garage that is cooler, you could keep it there. Good luck. I hope this helps. Let me know if you have any other question. As someone who is trying to restore my health I definitely avoid white refined cane sugar. I think even organic sugar is still refined. Is there any way to make this without the sugar? Will it still ferment? Will it have the same health benefits? What about Stevia? Honey? Pure maple syrup? Thank you for the time you are taking to respond to my queries. Thanks for your post. I completely understand your concern, a lot of people have this worry when they start to make fermented foods. The sugar aids in the fermentation process and it is a food for the bacteria, and won’t harm you. The bacteria is consuming the sugar, not you. The bacteria needs actual sugar to feed on, and the fermentation process will definitely not work with any other sweetener. If you are worried about all of the sugar not being consumed by the bacteria, you can let it ferment an extra day from when it starts to get tangy and fizzy and seems like it is done. I hope this helps. Let me know if you have any more questions. You can always use a less processed organic sugar instead of organic white sugar. I use Organic whole cane sugar (rapadura), which works well. I have a question about adding the ginger/turmeric when it is fermenting with the grains. I usually do a second ferment with fruit added then (w/o grains), instead of the first ferment. It seems like it would be hard to put ginger/turmeric in first ferment because it would be mixed with the grains, therefore when you strain the grains from the water you would have the G/T mixed in with them and could not separate them for another water kefir batch. Am I understanding your instructions correctly? Is there a reason the G/T is in the first ferment? You would still get the beneficial affects of the G/T in the second ferment. BTW, thanks for the pics! They are very helpful. Hi KCC, I have never used Rapadura, thanks for the tip. You don’t ferment the ginger and turmeric with the Kefir grains. You cook the ginger and tumeric in a pan for an hour to make a tea, then strain them, let the tea cool, add the sugar and the grains to the strained tea. I make Kombucha the way you are saying, adding the fruit at the end after the scoby is taken out, but you don’t have to do that here. Fresh tumeric root is really pricey here. $20 a pound. Do you think there’s a way to manage with dried? I couldn’t afford to do this very often. Yes, dried would definitely work. If you shop around online you should definitely be able to do better on the price. Try using about 1/3 of a cup dried in place of the 1 cup fresh. Good luck. Let me know if you have any other questions. I haven’t tried it but a lot of people have told me that Tumeric is very easy to grow so that might be an option for you. You could always use more ginger and less Tumeric to cut the cost down and it will still work. I hope this helps. Could I ferment it using whey that was strained from yogurt? Laura, I have never tried doing it that way. It is possible it could work but I don’t know for sure. I’m intrigued to try this. I read what you said above about sugar being necessary as food for the fermentation. Would honey work in this recipe? Hi Lynne, Honey absolutely will not work in this recipe, it has to be sugar. If you want to use something more natural, you can use organic sugar or rapadura. The sugar will get consumed by the bacteria in the fermentation process so you don’t have to worry about consuming yourself. This looks great, but can it be done without sugar added, will the fermentation still take the same amount of time, or perhaps longer? I do not think it would work. It does need sugar to get the fermentation process going. You could try using less and fermenting it longer. Thankyou I am feeling so healthy since o have been making this drink and drinking it, my health has improved . Lavendar, chocolate mint, lemon balm, rose geraniums, pineapple mint, all make nice beverages. The herbs also provide additional health benefits. I give these to my parrots– don’t let them become fizzy for pets. This works for kombucha and water or coconut kefir. to give the same positive outcome? Hi Alice, I have not tried this but I do believe that it would work. 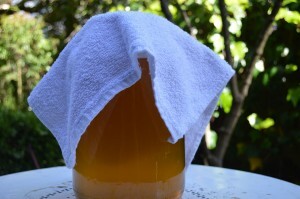 I’ve jsut started making kombucha…I’ve been using just regular tea…can I make your tumeric-ginger tea and then add that to my exsiting kombucha, which has the scoby in it. Thanks!